We undertook to produce bouncy, lofty and artful yarns that drape well. We spun numerous hanks, sampling each technique and assessing the fibre for crimp and curl. Other details when assessing your approach are stretch and twist. Skeins need atmosphere and intent is required in your approach to art. As well as spinning techniques, various drum carding methods were introduced and analysed. A batt can be constructed with speckles and running the fibre through twice helps with distribution. A 12 : 6/6 : 12 stripe and blend can be layered with the fibre on entry to the drum carder, see below. We were also taught how to handle fibre; picking, spreading out and layering. When scouring perhaps use three tubs with horse shampoo making sure the last wash is hot. Tease out and open up the fibre before entry and leave the turning handle in a different position each time to aid variegation. When drying a scoured fleece put it in a tied closed pillowcase in the tumble dryer to avoid clogging. Wensleydale is known for crimp and lustre, each fibre has characteristics that need to be carefully exploited; pick to loosen crimp, look out for shine, curl and debris free fleece. Are you processing woollen or worsted? Think outside the box - perhaps feed the carder sideways! What must you do to pre-prepare! Auto-wrapping is an intriguing technique, both skilful and fun. 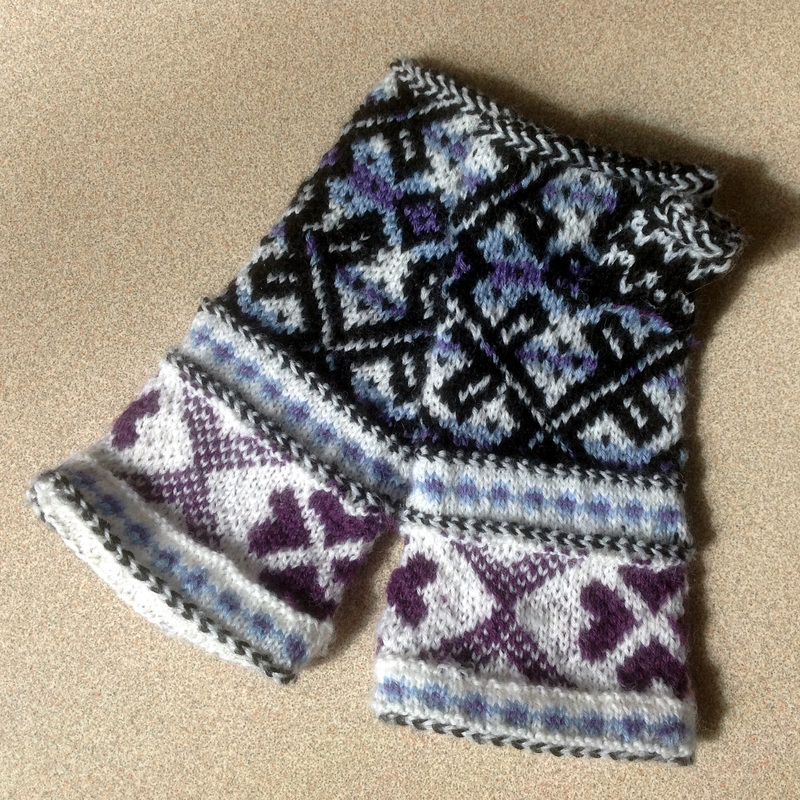 Ten lucky Guild members got together for Terri's two-day Baltic Mitts workshop ... lucky because Terri managed to squeeze the workshop in before she heads off on an eighteen month cycle trip to see her sister in Australia. Diligent students that we were, we had all done the required homework - knitting stranded samples with the yarns we planned to use for our mitts. The morning of the first day was spent browsing through a wonderful selection of stitch and pattern books, plotting and planning on graph paper (using the guage from our samples) and colouring in with crayons! After lunch we were let loose with our needles (magic-looping with cable needles or using four/five double-pointed needels) and, with mumbled curses, we slowly got to grips with the two-coloured Kihnu Troi cast-on. A week later we met again to continue our mitts under Terri's supervision. Sympathetic nods accompanied stories about the number of times we had had to frog back a mitt, or alter the pattern because we'd got the stitch count wrong, or couldn't work out why a Vikkel braid didn't look the same as everyone else's (yup, that was me and I hadn't read the instructions properly!) . Learning new techniques was great fun and Terri was patience personified, turning every looming disaster into a positive. A quick tweak of the pattern and a mistake was suddenly a part of the design! 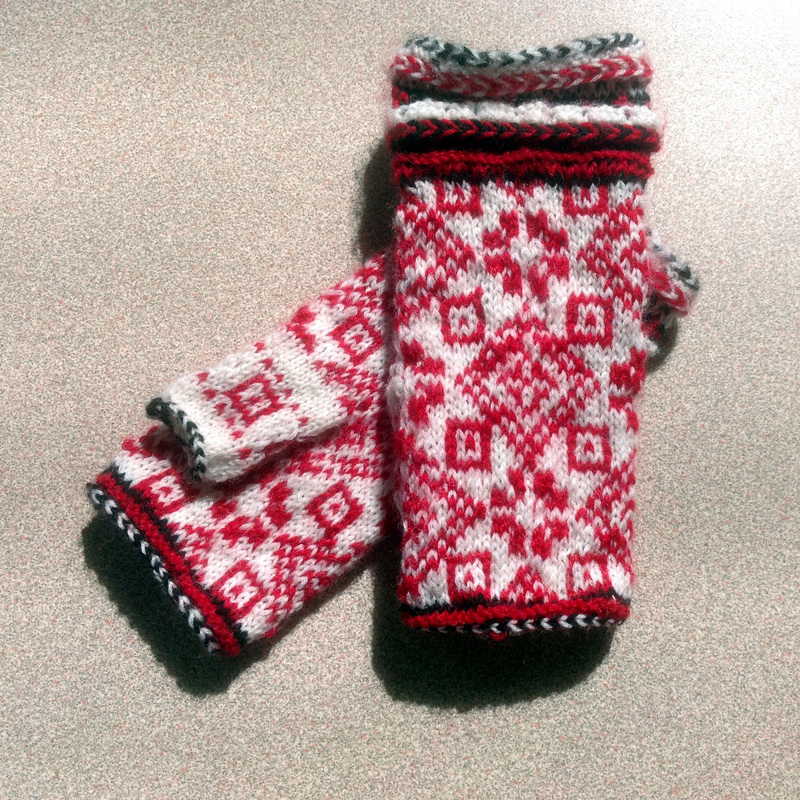 Peasant thumbs were explained, prepared for (on waste yarn) and even knitted. The magic was the huge variety of colours and patterns used for the mitts and the photos below should give an idea of this. 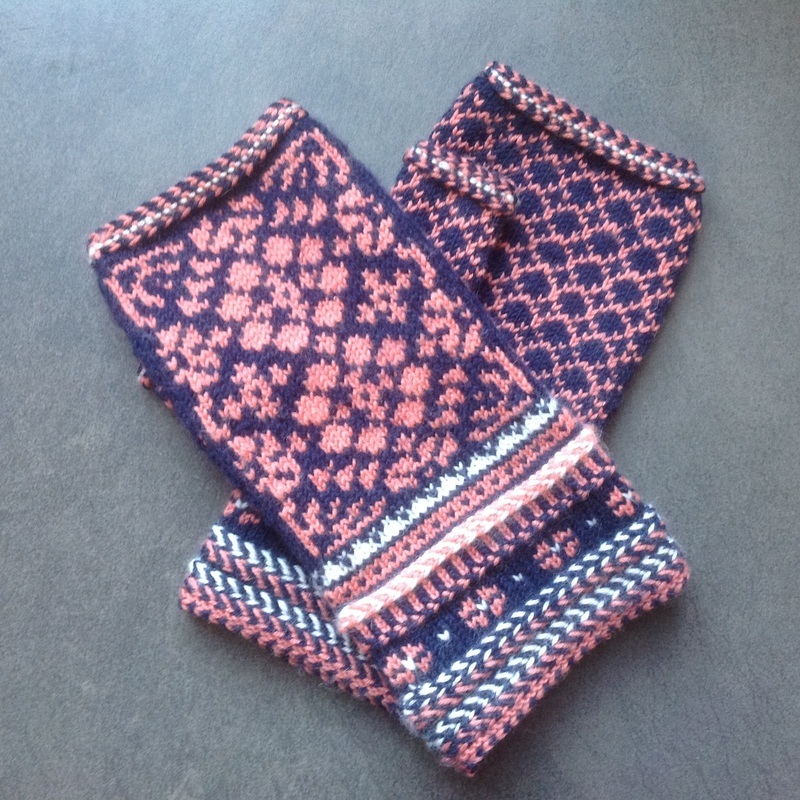 Hopefully we'll get photos of the finished mitts up on to the Projects page of this website before too long and most of us are already thinking about the next pair of Baltic mitts we want to make! Should we blame Terri or ourselves for yet another obsession?! 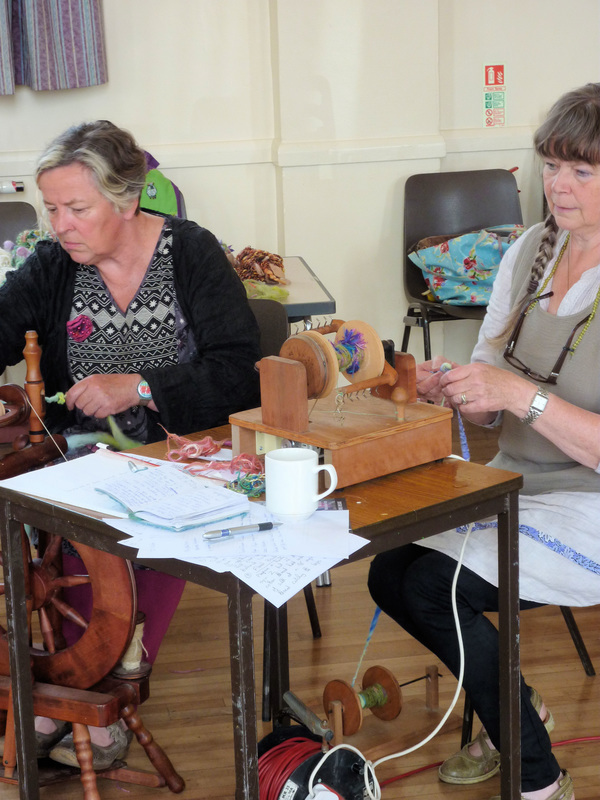 Following Jill Denton’s talk and having seen (and more excitingly been encouraged to touch) her vibrant felt art and gossamer fine nuno-felted clothing the previous day we were all eager to have a go at our own projects. By the day’s end we were far from disappointed! Jill is a generous and knowledgeable teacher. She was energetic in managing to tailor-make each of our experiences and we were enabled to produce delectable and versatile fabric whether we were novices or had some earlier experience of creating felt. From selecting our colour palette; to laying out our bubble wrap; to “wetting out” our fibres; to determining when our creations were complete and ready for rinsing, Jill was always available to help and advise. And her expertise and patience, together with her irresistible enthusiasm for felt, meant that we all gained in craftsmanship and confidence through the day. Using pre-felts that were offcuts from Jill’s work assisted us in gaining sharply defined edges or more subtle colour variation in our own pieces. Several of us who had already been on adventures in the medium of felt agreed that we had learned from Jill new “tricks” in encouraging fibres to “go in” and “shrink” in the desired direction throughout the day. 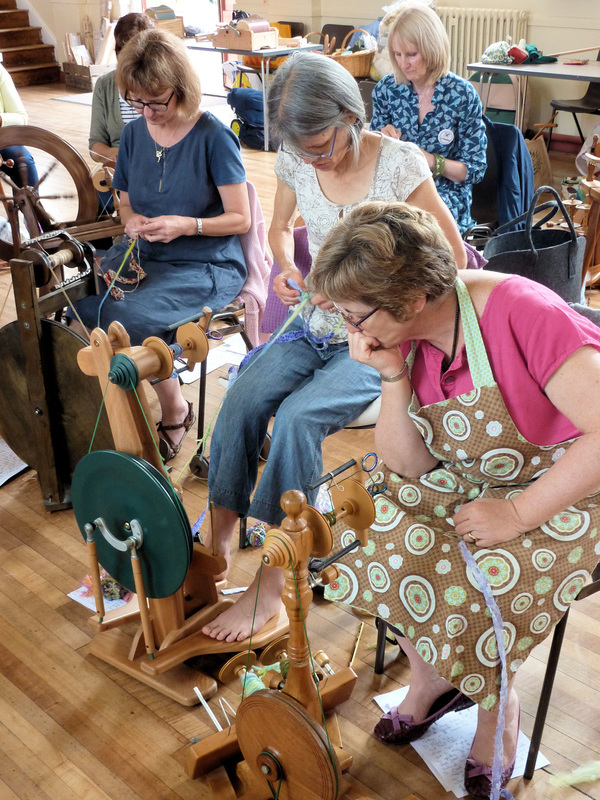 It’s a rare workshop where all participants are genuinely delighted with the work they carry home with them but this was undoubtedly one such learning and practical success. I don’t doubt that some kitchen sinks and plastic protected table tops will be in action in all our homes again soon!